Many thanks to HSC Pediatric Center in Washington, DC, for hosting the IPRC Steering Committee in June and to our dedicated Steering Members who participated in the conference. 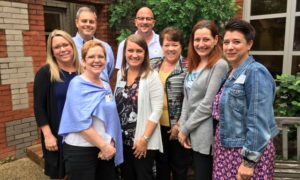 The group met for a two day session to reflect, plan, and set goals for IPRC for the upcoming year. The IPRC will continue to focus on the provision of high-quality education, increase opportunities for networking and idea sharing, and create and share clinical and administrative resources. IPRC also remains committed to lead the way with outcomes definition and collection in order to drive and support excellent care. While on site, the team met with Children’s Hospital Association representative, Jim Kaufman. Together, the group discussed ongoing advocacy initiatives, legislation being introduced on Capitol Hill, and ways that IPRC can become more involved. Stay tuned for updates to follow.